Technology makes society more efficient, but is moving faster always such a good thing? A new book delves into history and looks at the benefits and consequences of waiting. 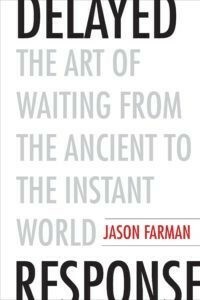 Delayed Response: The Art of Waiting from the Ancient to the Instant World, by University of Maryland-College Park professor Jason Farman, says speed can stifle innovation and creativity because people don’t take the time to think. He joined the Knowledge@Wharton show on SiriusXM to explain why good things come to those who wait. Knowledge@Wharton: We all remember the stories about the Old West and the days of the Pony Express, when there were delays in delivering mail. Communication has been a key part of our culture from the start. Jason Farman: In American culture, the ability to send messages at certain periods of time really shaped the ways that we understood this as a United States. As a coherent nation, message delivery was a really key part of that, especially after the introduction of postage stamps in the 1840s. Then you had the Civil War where soldiers were writing letters at an extraordinary pace, just really unprecedented. This was a way that people kept in touch with one another as they were spreading across the country and going out West. Messages and the infrastructures to deliver those messages were a fundamental component of American history and our identity as a nation as it developed. Knowledge@Wharton: As our society developed, the delays in communication dwindled, correct? Farman: That was the impression that I had going into the project, especially because I am a digital media scholar. I study mobile technologies and our cellphones and how we use them on a day-to-day basis. I was initially really fascinated by our impulse to connect with one another instantly, the promise that held and how compressed time has seemed to be in our own moment. And I was just curious, was that the same in eras past? Is there something in these eras where the delays were just really not a part of the expectations in a society? What I ended up finding was quite the opposite. There are so many interesting parallels between our moment and these past eras where the delays in responding to people were really paramount for how we connected, how we understood intimacy across these geographic distances, and the shaping of history as well. Really, it was shaped around how King Henry VIII interpreted the Pope’s delay. You see this over and over again across history: Delays become really meaningful for issues of power, our interpersonal relationships and how we exchange knowledge with one another. Knowledge@Wharton: One of the other things that you bring up in the book is the pneumatic tube system, which was an early version of text messaging. Farman: Starting in the late 1890s, several cities in the United States installed these tubes underground that would shoot up to 20,000 letters in a minute between post office stations. It ran all day long. People would just drop a note into the mail marked to be delivered through pneumatic tube, and they could exchange a dozen messages in a single day. People felt that this era was heralding in the moment of instant messaging, of being able to connect with each other at a very quick pace. Contextually, you had these pneumatic tubes delivering these messages pushed through with compressed air in these brass canisters, alongside the dominant message delivery technology at the time, which is a horse and wagon. People felt that they were living in the future, that all of a sudden the promise of instant connection was being fulfilled through these tubes. Our own contemporary moment of trying to connect with each other instantly has the same kind of mysticism. The industries that are driving our own technological moment tap into those same kind of promises that they had in the late 1890s all the way through the 1950s, when it was decommissioned. Knowledge@Wharton: How did a time like the Industrial Revolution change this process of messaging and delays? Farman: One of the things that I trace throughout the book is how these technologies shape our ability to synchronize with each other. If we are able to measure time more accurately, and also synchronize time with each other, it really transforms our expectations of how we connect with each other. 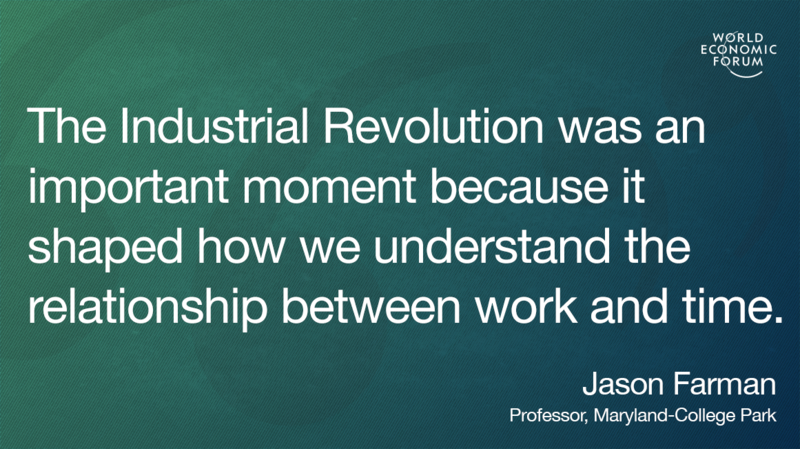 The Industrial Revolution was an important moment because it shaped how we understand the relationship between work and time. You have a new level of synchronization because you can measure technology more accurately. Simultaneously, you have the introduction of time zones. Globally, we are all on the same clock, or at least closer than we ever have been. As a worker walks into the factory line that day, they punch their time card. And at the end of the day, they do the same. We measure and have this idea of starting on time, of synchronization in a way that we hadn’t seen before that. That changes both the expectations interpersonally, and it radically changes what it means to be a worker and to have a work day. Knowledge@Wharton: There’s no doubt about the impact of delays on military operations. We have gone from the days of the Revolutionary War, where it could take weeks to get a message to the British troops that had come to the United States, to messages going to the military in instantaneous format. Farman: The interesting story that stood out to me in that was during the Battle of 1812. There was a truce that was signed, a treaty that ended the war, and that took place in Europe. The messages from that peace treaty didn’t arrive in the United States for weeks. Ultimately, what happened was the Battle of New Orleans was fought weeks after the war had already ended. It had no impact on the war whatsoever. It didn’t determine its outcome, but you had these thousands of soldiers dying because of this delayed response. One of the profound examples in the Civil War is during the Battle of Fredericksburg in Virginia. You had the Union army coming in, ready to make this surprise attack on Fredericksburg, which had maybe 500 or 1,000 Confederate soldiers defending it. The army would come in, sweep through Fredericksburg, go down to Richmond and end the war. But they couldn’t cross the river. The Rappahannock River needed a pontoon bridge to be built, and that pontoon bridge took about a month to arrive because of delayed messages. It ended up being a disastrous loss for the Union. Delays ultimately shape human history in some profound ways, especially in military conflicts. How quickly we can get messages to people shape the kinds of strategies that are engaged. For the everyday soldier in the field, messages are their link to their lives back home, so connecting them with those lives is a fundamental way of maintaining some kind of semblance of real life for them. Knowledge@Wharton: How do you think delays are regarded in society today? Farman: Almost across the board in Western culture, we see delays and waiting as a disruption to our lives. They keep us from using our time productively. We perceive them as wasted time when we could be doing other things. They produce boredom or loneliness or anxiety. Sometimes we feel powerless when it comes to these delays. Almost across the board, delays have a really negative connotation. The ultimate result of that is we are trying to build technologies that will speed up our lives, make our lives more efficient, which we tend to embrace in really positive ways. I love doing a Google search and having my every curiosity satiated in a moment. But I think the question that drives my inquiry in the book is, what are the costs of that kind of speed and that desire to eliminate waiting? What do we lose if we lose waiting? Knowledge@Wharton: People are busier today than they were 20 or 30 years ago. It is such a challenging time. Throw in the fact that we all have smartphones and we all text — that adds layers to the angst of many Americans. Farman: That’s right. I had a graduate student who was telling me about his partner’s new job at a tech company in the Silicon Valley. The partner’s phone would go off with text messages at 4 a.m. The partner would have to get up and answer those questions, sometimes return phone calls in the middle of the night, and was ultimately expected to be available at all times. With the introduction of email, text messaging, with technologies that reach into our homes and our private lives, we feel really overwhelmed because we are expected to be available at all times. Part of the elimination of waiting in our society is this drive to have us be productive citizens — the moral imperative of using your time wisely. That is producing results that we didn’t anticipate, where we are feeling incredibly busy and overburdened, and thus we are less productive. We are actually using our time in worse ways. We are not innovating on knowledge because we are consuming knowledge at a pace that we can’t quite do anything with it. I think the results are this very overworked, burdened, busy population that is actually not as productive and not as innovative as it could be if it shifted its perception and relationship to time. Knowledge@Wharton: While digital communication gives us speed, it takes away something because we are not talking to the other person. That lack of face time has become a drain on our culture. Farman: That is actually what started the book. When I started teaching undergraduate students, which was right around the time the first iPhone came out, I was really shocked to see how many text messages my students were sending in a single day. They were sending hundreds of text messages in a day. I just asked them, why don’t you call these people? What is the advantage of texting? Why did we decide to use a technology that makes us wait instead of a synchronous technology, a real-time technology that gets us talking with people to be able to hear the fluctuations of tone and voice, or meet face to face and see people’s expressions? The time that is introduced to these message exchanges that these people are doing, and that I am doing now with my own text messages, is filling in some of those gaps of nonverbal communications where delays are interpreted as a cue. It is a really fascinating shift, I think, and one that got me going into this book to begin with. Knowledge@Wharton: It doesn’t appear like this is going to get any better moving forward because of our reliance on the technology and that mindset of quicker is better. Farman: I think we see throughout history that people have felt similar things to what we are feeling. People in eras past have felt that they were in an accelerated culture because technology is continually speeding up our ability to connect with other people and to connect with ideas, knowledge and messages. However, we do see a pushback in our own contemporary moment to this culture of speed. You have people who are trying to introduce delays that are productive. You have people who are developing slow movements, for example, trying to re-center our use of time. The slow movements go from the food movement to slower education. There is slow publishing, this idea that maybe the pace of the tenure track is untenable and producing particular kinds of knowledge over others. Even in religious movements you have people who are trying to embrace pausing, meditation, slowing down our lives in order to identify what is lost in a culture that values the instant. Pauses can be really productive if we re-center our attitude towards them. Knowledge@Wharton: What about the influence of email? Farman: The difference between the email and the text is, I think, a significant one. Even though we have email on our phone, the medium of the text allows for a certain form of brevity. We can quickly shoot off a text while emails sometimes require a different relationship to content and the amount of content we are expected to produce. Similarly, how many people are on an email chain versus maybe the more intimate sphere of the text message? Also, texting is related to your phone number as opposed to just simply finding that email address. So, I think email has very different expectations when it comes to how much time you are supposed to devote to it, and we really can’t keep up. I think it is a technology that, by design, is overwhelming and very difficult to keep up with in our society now. Knowledge@Wharton: What role does the media play in this process? Farman: When I look out at the media landscape, the timing of media exchanges of knowledge is extraordinary. You have things from just-in-time news all the way to your everyday person finding out what is happening on Twitter versus a major news outlet, for example. You have social media competing with the news industry in terms of how timely it is, how quickly it can put knowledge out there, or what is happening with particular kinds of events. What you see is an increasing pace of trying to get news out there, whether it be the problems around verification, and then also just the need to keep up with the moment. Over the last two years and this particular moment and this presidency, the pace of news has become really extraordinary and really interesting to watch. We are unable to have these moments of pause because we have to keep up, the news industry needs to keep up, with the latest things happening. It is transforming what has happened to the industry as a whole. It is a radically different place. Knowledge@Wharton: It doesn’t give us a chance to be off. We are always on, and that is something we are passing down to our kids. Farman: The effective or emotional impact of that can’t be overstated. Being always on and feeling that the latest news alert getting sent to my phone can really transform my day because all of these things are happening around me. Sometimes I feel very powerless to do anything about that news. We are presented with this information all day long. What do we do with it? What are we supposed to do with the knowledge we get on Google or the news that we get through the radio or in the newspaper or on Twitter? I don’t think we are giving ourselves enough time to answer that question. We don’t know what to do with it, so we just keep being pulled into this future, feeling like we don’t have a sense of agency over how to change things, how to intervene. I think about the emotional toll of being connected always and not being able to sit with something for a moment to think — what do I do with this? How do I innovate on it? How do I transform things? How do I do something? I just feel like I am just being bombarded nonstop throughout the day. The pauses are really essential for us to have a sense of emotional well-being and that we can actually do something with this knowledge. If industries embraced that perspective, we would see innovation at a different pace. We perceive those breaks and wait times, or just sitting and daydreaming, as unproductive. If we instead embrace them as productive moments, we would see some massive changes in particular industries.